Many owners of Nest Cam and similar home security cameras see value in using the device for outdoor monitoring. Sure, you could buy an outdoor home security camera, but there are challenges with finding power and worries about security of the camera. That’s where using the camera behind a window come in. We look at a good solution for this situation which is a window shelf for Nest Cam or other similarly shaped home camera. The photo that accompanies this article is the ElHook Stick-On Nest Cam Security Video Wall Mount. As you can see, it’s a handy way to perch a camera onto a window. The mount can also be attached to a vertical wall. It’s available in black and white. Before digging deeper into the mount, note this shelf fits many other cameras besides a Nest Cam. The base of the mount measures roughly 2.5 x 2.5 inches. Any similarly sized security camera can fit onto the mount. Besides Nest Cam, candidates that come to mind are DropCam Pro, Yi Home Camera and the Wansview Home Camera. The camera attached in the photo is a Yi Home Camera so you can see the camera doesn’t need to be a Nest Cam. The camera mount comes in a 2-pack. It’s made of plastic and comes with a set of adhesive strips. A set of two adhesive strips are used for attaching the shelf for Nest Cam to the window or wall. First be sure to clean the mounting surface with an alcohol wipe. This wipe isn’t included and you may not have one sitting around the house. The instructions that come with the shelf for Nest Cam specifically exclude use of commercial cleaners like Windex. After cleaning the area thoroughly, it’s time to attach the shelf for Nest Cam to the window or wall. The adhesive strips are designed to provide a strong temporary hold onto the flat surface. Be aware, you only get one chance at this so be sure it’s properly placed and level prior to committing to attachment. If more are needed, you can consider Command Refill Strips as a replacement. Now it’s time to attach the camera to the shelf. A 3M VHB red adhesive strip is already attached to the top of the mount. This will be used to adhere the window shelf for Nest Cam to the camera itself. VHB is an acronym for Very High Bond. We often see this type of adhesive used on car dash mounts for much heavier devices. It’s rather permanent so be aware it will take a little work if you decide to remove your camera from the mount. Often it’s a tedious process of slipping a thread between the camera base and shelf for Nest Cam. See our article on removing a car dash mount for some helpful tips. 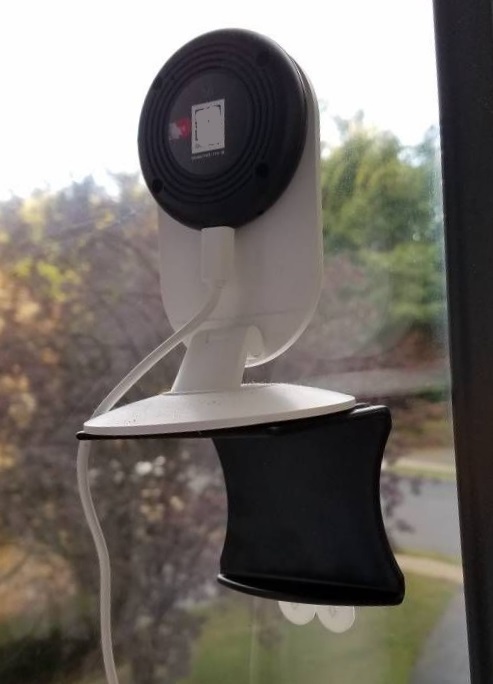 The ElHook Stick-On Nest Cam Security Video Wall Mount is a nice add-on accessory for surveillance of the outdoor situation of your home or office. If using the shelf for Nest Cam to see outside a window, be sure to get the lens as close as possible to the glass. To improve night vision, turn off the status light on the front of the camera. Also deactivate the night vision IR lighting as that will totally obliterate any view.